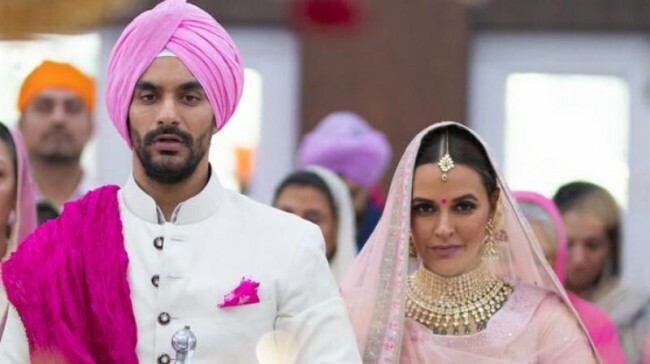 New Delhi, May 10 (IANS) Actress and former beauty queen Neha Dhupia had a hush-hush wedding with actor and “best friend” Angad Bedi, son of ex Indian cricketer Bishan Singh Bedi here on Thursday. She has called it the “best decision” of her life. The newly wed couple got married in an Anand Karaj ceremony attended by close family and friends in a Gurudwara in south Delhi. They made the announcement via social media. “Best decision of my life… Today, I married my best friend. Hello there, husband! Angad Bedi,” Neha posted on her official Instagram page along with a photograph from their wedding proceedings. For the ceremony, Neha looked resplendent in a soft pink ensemble with a pink bindi accentuating her look. Her heavy jadau jewellery added to the elegance. The groom wore a cream sherwani with a ‘saafa’ matching Neha’s ensemble, and he carried magenta accents for a dash of colour. A source close to the couple told IANS that Neha and Angad wanted a very intimate ceremony, and so there was not much buzz about it. From the film industry, celebrities like Karan Johar, Soha Ali Khan, Raftaar, Harshvardhan Kapoor, Rannvijay Singha, Sophie Choudry, sent in early congratulatory messages to the couple via Twitter. “My darling and most special friend Neha Dhupia who I love and adore dearly is married to the gentleman and talented Angad Bedi! Here’s wishing them decades of unconditional love,” Karan wrote.